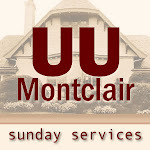 Readings and a sermon from The Unitarian Universalist Congregation at Montclair by Rev. Darrell Berger, minister of the First Unitarian Universalist Church of Essex County in Orange, NJ. While Darrell is here with us today, our minister Charlie Ortman is filling his pulpit in this longstanding Unitarian tradition of pulpit exchange. From Holy the Firm by Annie Dillard. Readings and a sermon from The Unitarian Universalist Congregation at Montclair by one our Affiliated Community Ministers, Rev. Linda Goonewardene. From #22 of the Tao te Ching by Lao-Tzu, translated by Stephen Mitchell. From Legacy of the Heart: The Spiritual Advantages of a Painful Childhood by Wayne Muller. From the script of the movie, Avatar, written by James Cameron.